The Dalai Lama in Pisa Italy. There has always been something in my life, hovering around me that I’ve never understood. Something hard to put into words, that felt like both a good and bad thing. I used to wrestle with it when I was young – this nameless, shapeless thing that followed me. On the one hand, I had this amazing childhood in the wilds of Scotland with amazing parents, who did the right thing by me with my ADHD. I felt great. Like I had a special gift – that I was here to do something extraordinary with it (no idea WHAT, but that was a general feeling!) At other times I felt like a freak. Just an oddball, disconnected from everyone and misunderstood. So crazy good and crazy bad things have happened in my life to lead me to where I am today, doing what I do today. Today I am the co-founder of One Year No Beer, leading a movement that changes lives by changing people’s relationship with alcohol – leveraging our reach across the world with technology. Today I had a huge ‘AHA’ moment. Suddenly everything is clear. It feels like all things that happened in my life, happened for a reason, bringing me to this point. 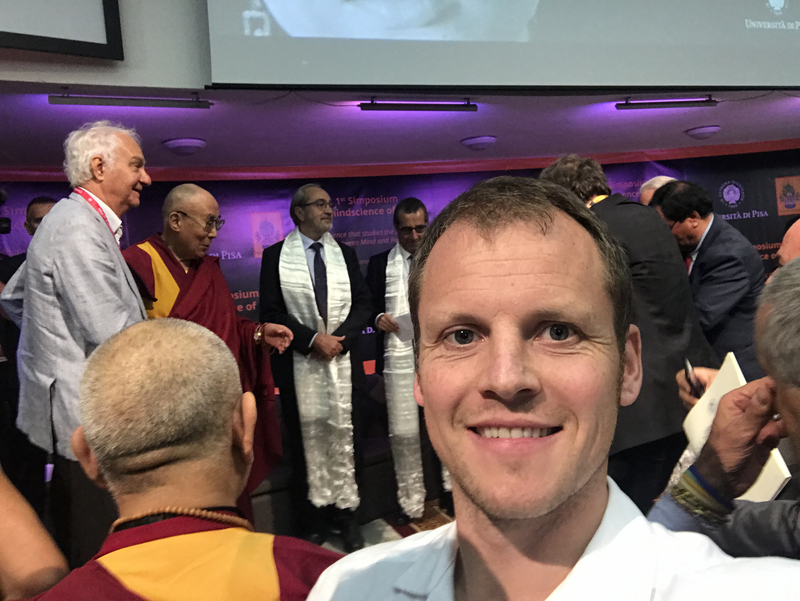 Including the randomness of today – being chosen from thousands to stand up in front of His Holiness the Dalai Lama and speak directly to him – and for him to speak back to me on this matter (of alcohol/addiction). The dialogue we had is below. But on the subject of lives hampered by alcohol, and how to change this, His Holiness said he has no experience, and that I know better – that One Year No Beer is better placed. And you know what! I get it. Finally, I GET IT. I do have that experience, and the drive, passion and purpose to reach out to the world and create change. Create happier lives by putting alcohol in its place. No stigma, no labels, just tons of support and a community to hold you up. That is what One Year No Beer does. As of today, many things that never made sense, do make sense. I guess all my life I’ve had a calling, but I didn’t know it. And before I was ready to put the foot-work in, I had to be made ready by life experiences and certain teachers coming my way. I talk openly and readily about ADHD, suicide attempts and self-medicating with alcohol. Those days are now gone. They were hard, but they played a valuable part in creating the driving force behind who I am and One Year No Beer. There is something much bigger than a couple of blokes steering an alcohol-free movement via One Year No Beer. Andy and I are the conduits for this bigger thing moving through us. And that makes me feel very humble. His Holiness the Dalai Lama is quoted as saying ‘The purpose of life is to be happy’. I know something extraordinary is happening in the hearts, health and happiness of the world, concerning alcohol and addictions – and you heard it here first folks. As I talked with His Holiness the Dalai Lama, he spoke of the importance in systematically educating the future generation about how to achieve inner peace. Then perhaps negative emotion won’t drive the need for alcohol and drugs.? Something for us ALL to think about. So, a few hours later – what am I thinking? Don’t sweat the small stuff – things are always working out towards something! Keep your eyes open for opportunities to learn or find a teacher – easy to miss! No experience is wasted – everything is learning and wisdom! Notice the small moments – they are stepping stones to the big moments! Seize the day – when you get that gut feeling – you might feel scared – maybe you should do it anyway! ABOVE ALL – STRIVE TO BE HAPPY! Ruari Fairbairns is an Entrepreneur, Senior Oil Broker and Co-Founder of the OYNB Movement. He has helped over 25,000 members in 100 countries transform their lives by taking their science-backed 28, 90 & 365-day alcohol-free challenges to change their mindset around alcohol.